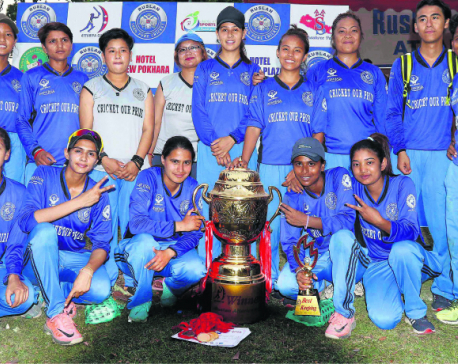 The owner of Kathmandu Super Champions Rekha Thapa (center) pose with marquee players Rubina Chhetri (Bhairahawa Queens, first left), Karuna Bhandari (Biratnagar Roaring Lioness, second left), Sita Rana Magar (Dhangadhi Wonder Women, second right) and Nery Thapa (Kathmandu, first right) during the National Cricket League Women’s T20 League announcement in Kathmandu on Monday. KATHMANDU, March 19: First ever women’s franchise-based T20 league, organized by National Cricket League (NCL) Sports Pvt Ltd, is set to be held in Baijyanathpur Cricket Ground, Biratnagar from April 20 to 27. 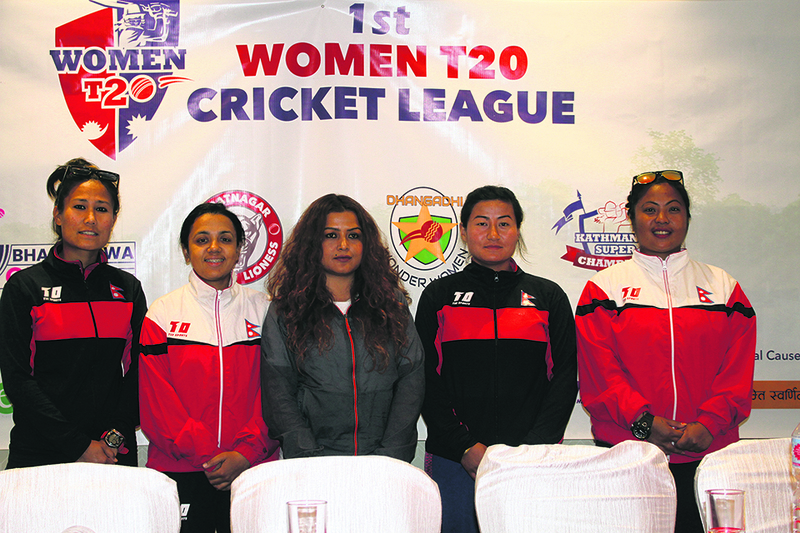 The NCL Women’s T20 Cricket League is the first premier cricket event for women players in Nepal. Four franchise teams based on major cities of Nepal will acquire cricket players through an auction divided in three different grades. Grade A players will receive between Rs 40,000 and Rs 75,000 followed by Grade B and Grade C players between Rs 25,000 - 50,000 and Rs 15,000 - 25,000 respectively. Four franchises -- Biratnagar Roaring Lioness, Bhairahawa Queens, Dhangadhi Wonder Women's and Kathmandu Super Champions -- will tussle in the first season of the league. Likewise, Karuna Bhandari, national women’s cricket team captain Rubina Chhetry, vice-captain Sita Rana Magar and Nery Thapa respectively were appointed as marquee players. "Women are discriminated in Nepal. We remember how none of the sports officials went to the airport to receive national cricket team after finishing second in the world cup qualifiers. Hopefully, this kind of league will help diminish such discriminations. 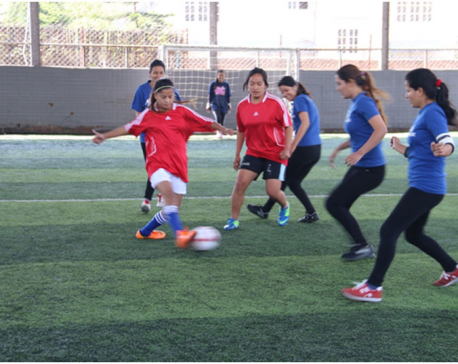 All the participants are already winners," said Rekha Thapa, the owner of Super Champions, speaking at the event. "We used to play only one domestic event in a year to prove ourselves worthy of national team. Now, such leagues will help us stay competitive and find a good player for the national team," said Magar after being announced as the marquee player. She thanked the event organizers for making it possible. The winner of the event will receive a cash prize of Rs 1 million followed by Rs 500,000 for the runner up. Similarly, each player of the match will get the cash amount of Rs 10,000 followed by other individual awards including player of the series which are yet to be decided. The chairman of the events, Raya claimed the event to be Asia’s first and assured to bring more events in future for the betterment of Nepali cricket. "We want to help, support and host events for Nepali cricket, mainly for women cricketers who need professional setup as well. This will be Asia’s first ever women’s franchise-based league. We have more events including age-level tournaments lined up for future, Raya said. The tournament got postponed by five days from the previous date of April 14 to 22 due to the busy schedules of national cricket which saw Chief Minister Cup being hosted in Bhairahawa and imminent 8th National Sports to be hosted in Nepalgunj (Province 5) in the same month, according to Raya.